Juicy, mouthwatering, tender slices of pork, topped with a sweet mixture of apples and cherries. 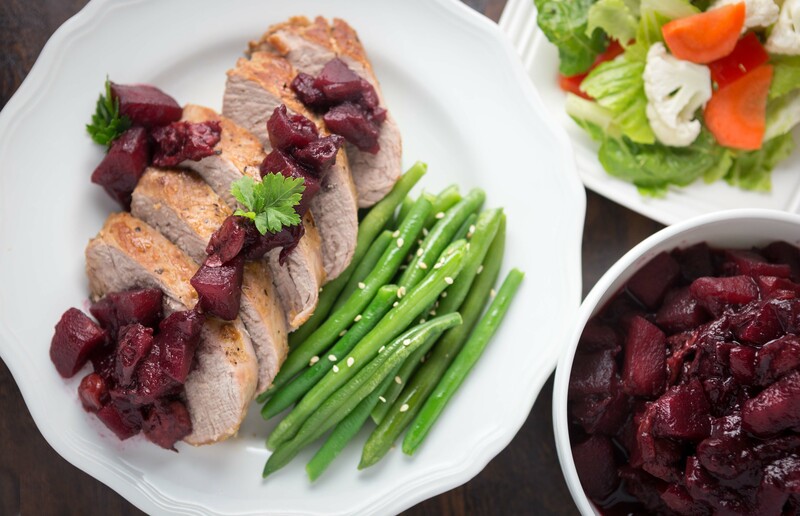 For a gourmet Easter feast, or a quick weeknight meal, this Pan-Seared Pork Tenderloin with Cherry Apple Chutney is an easy and fantastic way to serve pork tenderloin. Happy Sunday! This week I hit the 32 week (8 month) mark in this pregnancy. Yikes! The weeks are just flying by. There are still so many things to conquer on my to-do list before the new little guy arrives! I’m so thankful that my sister came over this weekend and helped me organize some of the boys’ clothes that have been stacking up. We didn’t get through everything in the clothing department, but at least we made a dent in it, and had a blast hanging out together. 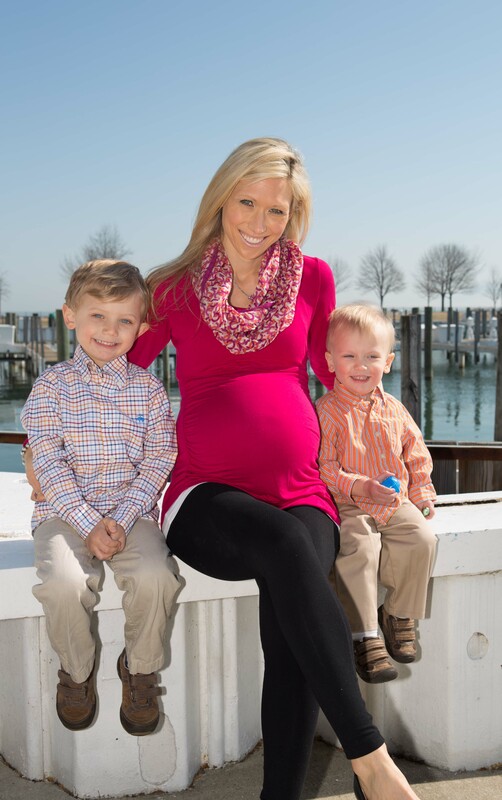 We had such a great time yesterday hunting for Easter eggs and visiting the Easter bunny with the boys. William ran right up to give the Easter bunny a huge hug and sat right on his lap. James, however, was clinging to me for dear life, and couldn’t have been more terrified. (We remember that William did the same thing when he was two, but thankfully he has outgrown that fear.) Maybe James will be more excited next year. 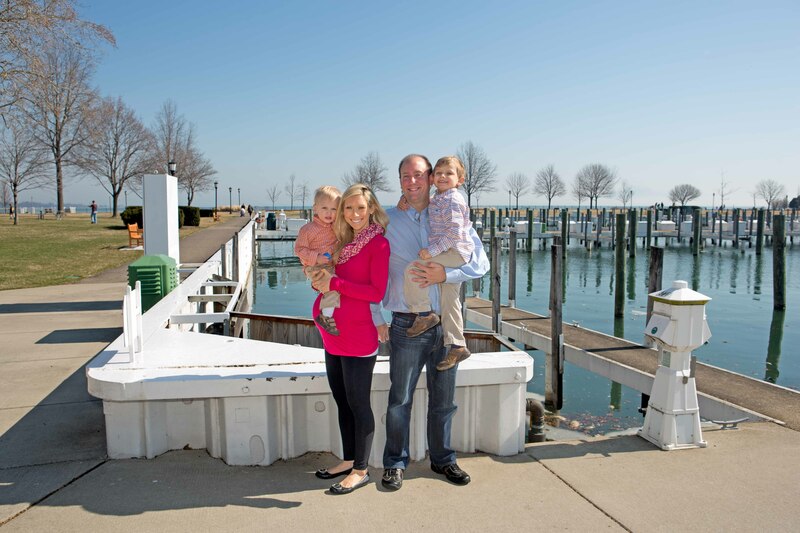 After our visit with the Easter bunny, we walked outside in the sunshine and snapped a few family pictures. I can’t believe Easter is only a week away! If you like to plan ahead like I do, I bet you’re already thinking about what you will be cooking for a wonderful Easter brunch or dinner. This year we are going to have a casual brunch at home just the four of us, after church, and then I’ll be cooking up a fancy little feast for a larger group for dinner at our house. 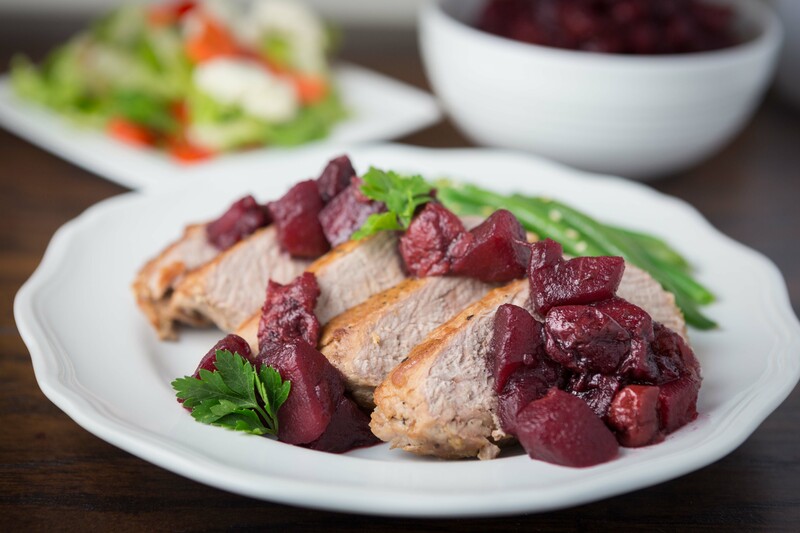 Our menu looks like this: Pan-Seared Pork Tenderloin with Cherry Apple Chutney, roasted tiny potatoes, steamed green beens with toasted almonds, and a green salad with creamy balsamic vinaigrette. Yum!!! For dessert, I’m still deciding between Good For You Mini Carrot Cakes, or Mini Banana Cream Pies. I can’t wait! 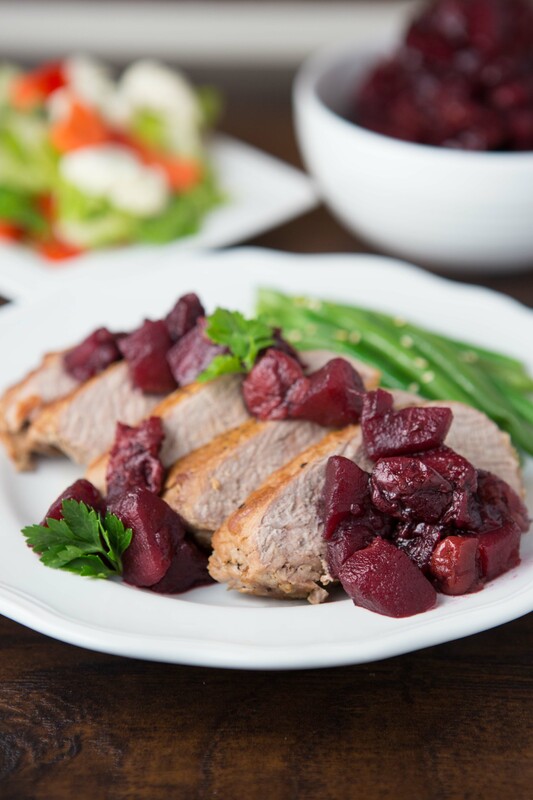 Pan-Seared Pork Tenderloin with Cherry Apple Chutney is a great way to celebrate a special occasion or any day. It is quick, easy, and the cherry apple chutney can even be prepared in advance to help save valuable time. Healthy, filling and incredibly delicious. Loved by adults and even the picky little eaters in the family, this recipe is a great crowd-pleaser any night of the year! Trim and remove the silver skin from pork if present. Season all sides of the tenderloins with salt and pepper. Allow pork to sit out at room temperature for 15-20 minutes. In the meantime,combine apples, cherries, water, wine, cinnamon, allspice, cloves, salt, honey, and minced date in a medium sauce pan. Bring to a boil, then reduce heat to low and bring to a low boil/simmer for about 30 minutes until apples are soft and sauce has thickened. While sauce is cooking, heat 1 1/2 teaspoons extra-virgin olive oil in a large non-stick skillet over medium-high heat. Sear tenderloins on all sides, making sure to get a nice brown color on each side. Cover, reduce heat to medium-low, and cook, turning occasionally, until almost cooked through. Remove lid, increase heat to medium-high and finish cooking and browning until just cooked through or meat thermometer registers 145 degrees. Remove pork from pan, and place on a clean plate and tent with aluminum foil. Allow pork to rest for about 10 minutes. Move pork to a cutting board and slice into 1/2" thick pieces. Serve sliced pork with warm apple cherry chutney. Thanks! We’ll definitely check that out. WordPress 3.9 is a bit of a mess with some of our plugins not working. The email subscription button is along the right side about halfway down the page! Thanks so much for visiting! You can also sign up to have new posts emailed to you by typing your email address in the form on the right side. Hello there, I discovered your website by way of Google even as searching for a related matter, your website got here up, it appears great. I’ve bookmarked it in my google bookmarks.